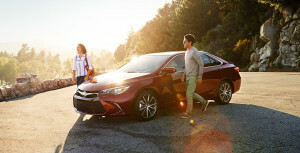 If disaster strikes and you need a reliable vehicle fast, if you’re taking a trip across the southeast, going to join in on the summer activities in Marietta, or if you just want to give a new Toyota model a try, a Toyota rental car may just be the right choice for you. The SE trim of the 2019 Toyota Camry is a fantastic vehicle that combines excellent performance capabilities, outstanding fuel economy, and luxurious interior features to give you the most reliable and comfortable rental driving experience available on the market today. We proudly serve the areas of Marietta, Smyrna, Vinings, East Cobb, Roswell, and Atlanta, and we hope to see you soon at Marietta Toyota to put you behind the wheel of your very own Toyota rental vehicle today! Engine Type: 2.5-liter 4-cylinder 8-speed automatic. DOHC 16-valve dual VVT-i. Performance Specs: 203 hp @ 6000 rpm; 184 lb-ft @ 4100 rpm. Fuel Economy: 28 mpg*/39 mpg*/32 mpg* (city/highway/combined). In addition to this outstanding balance of performance, power, and fuel efficiency, you will also gain access to MacPherson strut front suspension with gas-filled shock absorbers and a stabilizer bar to help your vehicle handle the elements and get you from point A to point B and beyond with the minimal possible amount of bumps along the way. Entune 3.0 Audio System: Multimedia bundle with a 7.1-inch touch screen display, Apple CarPlay high-quality speakers, USB 2.0 ports, hands-free phone capabilities, Siri Eyes Free technology, and an integrated backup camera display among many other revolutionary features. Smart Key System: Push Button Start technology and remote illuminated entry provide a powerful combination of smart key systems to make your driving experience that much more comfortable, convenient, and secure. Sport Fabric SofTex Front Seats: Seatback pockets; 8-way power-adjustable driver’s seat with power lumbar support; 6-way adjustable front passenger seat. The new Camry SE looks like a million bucks with its sophisticated lines and no-nonsense design approach. In addition to these visual elements, you also have access to a variety of high-quality colors, including Midnight Black Metallic and Ruby Flare Pearl. With nearly a dozen color choices from which to choose, you can design your Toyota Camry to your heart’s content. Here are a few other key external features: an aggressive – yet athletic – design, sport mesh front grille, bi-LED headlights, 18-inch alloy wheels, and much more. Toyota Safety Sense P (TSS-P): Pre-collision system with pedestrian detection, automatic high beams, dynamic radard cruise control, lane departure alert system. Star Safety System: Star Safety System™ — includes Enhanced Vehicle Stability Control (VSC), 27 Traction Control (TRAC), 4-wheel Anti-lock Brake System (ABS), Electronic Brake-force Distribution (EBD), Brake Assist (BA) 28 and Smart Stop Technology® (SST) 29. Comprehensive Airbags for Maximum Safety: Includes driver and front passenger Advanced Airbag System, driver and front passenger seat-mounted side airbags, driver and front passenger knee airbags, rear seat-mounted side airbags, and front and rear side curtain airbags. Advanced Seatbelt Technologies: 3-point seatbelts for all seating positions; driver-side Emergency Locking Retractor (ELR) and Automatic/Emergency Locking Retractor (ALR/ELR) on all passenger seatbelts. Rent a 2019 Toyota Camry SE Today at Marietta Toyota! The 2019 Toyota Camry SE is a fantastic rental vehicle that provides top-notch reliability, comfort, and efficiency – all in one affordable package. Visit us today at Marietta Toyota! We’re located at 750 Cobb Parkway South in Marietta, GA 30062, and you can give us a call for more information at 800-419-0621, or send us a message online. We look forward to helping you choose the right rental car for your specific situation. Complete our easy rental form online today for priority service! High Season Rates Applicable March 31 – July 31. Rental Qualifications: All Drivers must be over the age of 21, Valid Driver’s License, Full Coverage Insurance (Comp/Collision) that includes Rental Car Usage (i.e., your insurance must transfer coverage), and a fully Refundable Damage Deposit of $250 if paying by Credit Card OR $350 if paying by Debit Card. A $50 Reservation fee, applied to the cost of your rental, is also required when reserving a vehicle in advance.No Credit Check Needed! Call us today at (678)398-4063 & make your next family vacation, or weekend getaway more enjoyable for everyone! *2017 EPA-estimated city/highway mileage. Actual mileage will vary.